The 2017 fire season was the nation’s costliest, according to the U.S. Department of Agriculture, which houses the Forest Service. That agency’s annual budget is increasingly dedicated to suppressing and fighting wildland fires, as longer seasons and more destructive blazes require more resources. Millions of acres have burned in the West this year, mostly in California, Montana and Oregon. Some of the West’s biggest fires began in September, at a time when the fire season is typically waning. But by mid-September, California had declared the first of several states of emergency, when blazes threatened giant sequoias in Yosemite National Park. Nowhere were fires more intense than in Montana, where more than 1.2 million acres burned. In Oregon, the Eagle Creek Fire tore through the Columbia River Gorge. With long-term climate trends portending more frequent droughts, this kind of severe and expensive fire season is more likely to become the norm. According to the National Interagency Fire Center’s most recent wildfire potential outlook report, it’s not over, either: Southern California should see higher than normal wildfire activity well into 2018. A typical fire season in the West could soon last more than 300 days. More than 33 percent of houses in the U.S. are in the wildland-urban interface. 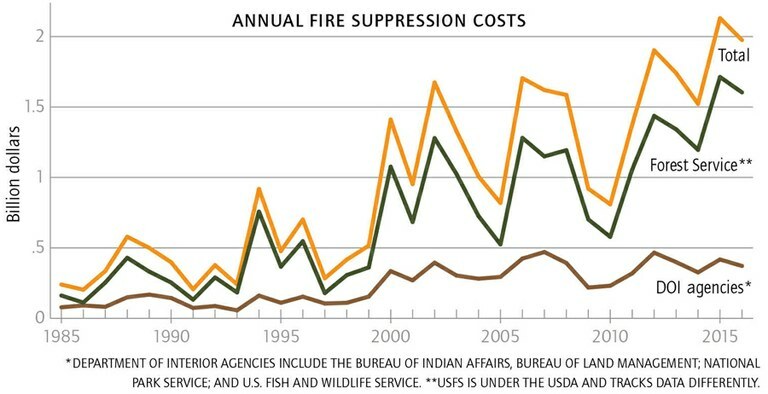 Such development increases the cost of wildfire protection. On average, about 85 percent of wildfires in the United States are caused by people. About 28,000 personnel, 1,900 engines, 250 aircraft and 200 active-duty military personnel were deployed during the peak of the 2017 fire season. 114 percent, from 5,700 employees in 1998 to over 12,000 in 2015.